WHAT IS THE TOFURKY TROT? The Tofurky Trot is a family-friendly 5k (3.1 mile) fun run, trot, or walk open to all levels of physical fitness, followed by a vegan food fest featuring local and national vendors, speakers, and music (no separate ticket purchase necessary for food fest). Prizes and medals will be awarded to the first male-identified, female-identified, and child finishers, as well as for best human costume and best dog costume! All runners will receive a Tofurky Trot tote-bag filled with coupons and swag. T-shirts will be available to purchase. Please note that runners will receive bibs and a race clock will be present at the finish line; the race will not be chip timed. WHO IS ORGANIZING THE TOFURKY TROT? The LA Tofurky Trot is organized by the Factory Farming Awareness Coalition (FFAC), an educational non-profit empowering people to help save animals, the environment, and our own health through our daily food choices. 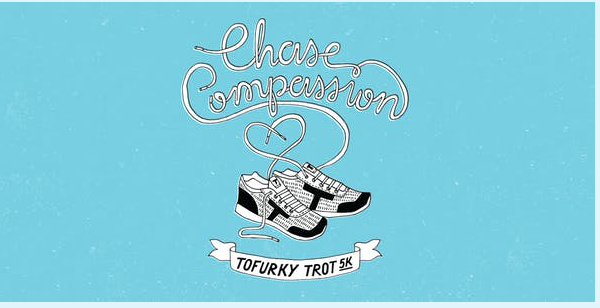 All proceeds from the Tofurky Trot benefit FFAC's humane education program. Tofurky is the principal sponsor of the Tofurky Trot. WHAT IS THE VEGAN FOOD FEST? Advance packet pickup will be held on Saturday, November 24th, from 3:00-6:00pm at the Fleet Feet Sports store in Burbank, CA (1516 West Magnolia Blvd, Burbank, CA 91506). This is a fun, family-friendly event! Well-behaved dogs on a short leash are welcome to join the fun. We will have water stations for humans and dogs alike. We need lots of volunteers for all different kinds of roles at the Tofurky Trot! If you'd like to help out at the event, please fill out this form. SET UP A FUNDRAISING PAGE AND WIN PRIZES! Set up your own fundraising page for your chance to WIN fantastic prizes from Vegan Cuts, Veestro, and more! All proceeds benefit the Factory Farming Awareness Coalition (FFAC) and Kindred Spirits Care Farm. Details TBA.